But disclosure of ERM processes has been much more widespread and much more extensive in other parts of the world for more than 5 years. Manulife Financial is a financial institution offering insurance, wealth and asset management products and services, which subjects the Company to a broad range of risks. We manage these risks within an enterprise-wide risk management framework. Our goal in managing risk is to strategically optimize risk taking and risk management to support long-term revenue, earnings and capital growth. We seek to achieve this by capitalizing on business opportunities that are aligned with the Company’s risk taking philosophy, risk appetite and return expectations; by identifying, measuring and monitoring key risks taken; and by executing risk control and mitigation programs. We employ an enterprise-wide approach to all risk taking and risk management activities globally. The enterprise risk management (“ERM”) framework sets out policies and standards of practice related to risk governance, risk identification, risk measurement, risk monitoring, and risk control and mitigation. With an overall goal of effectively executing risk management activities, we continuously invest to attract and retain qualified risk professionals, and to build, acquire and maintain the necessary processes, tools and systems. We manage risk taking activities against an overall risk appetite, which defines the amount and type of risks we are willing to assume. Our risk appetite reflects the Company’s financial condition, risk tolerance and business strategies. The quantitative component of our risk appetite establishes total Company targets defined in relation to economic capital, regulatory capital required, and earnings sensitivity. We have further established targets for each of our principal risks to assist us in maintaining appropriate levels of exposures and a risk profile that is well diversified across risk categories. In 2010, we cascaded the targets for the majority of our principal risks down to the business level, to facilitate the alignment of business strategies and plans with the Company’s overall risk management objectives. ■ Activities related to risk control and mitigation. Such frank discussion of risk and risk management may be seen by some US insurers’ management to be dangerous. In the rest of the world, it is moving towards a situation where NOT discussing risk and risk management frankly and openly is a risk to management. the top three corrective actions for the next quarter. Update the list quarterly. That sounds like a great suggestion. RISKVIEWS has always been amazed that the standard for disclosure in the US has been to disclose risks but not to say anything about what the firm is doing about those risks. Based upon the standard disclosures, it is almost impossible to tell the difference between a firm with state of the art risk management and a firm with almost none. But recently, companies, even in the US, are increasingly including a mention of their risk management activities along with the required laundry list of risks. Because of the exposure of our property and casualty business to catastrophic events, our operating results and financial condition may vary significantly from one period to the next. Catastrophes can be caused by various natural and man-made disasters, including earthquakes, volcanoes, wildfires, tornadoes, hurricanes, tropical storms and certain types of terrorism. We may incur catastrophe losses in our auto and property business in excess of: (1) those experienced in prior years, (2) those that we project would be incurred based on hurricane and earthquake losses which have a one percent probability of occurring on an annual aggregate countrywide basis, (3) those that external modeling firms estimate would be incurred based on other levels of probability, (4) the average expected level used in pricing or (5) our current reinsurance coverage limits.Despite our catastrophe management programs, we are exposed to catastrophes that could have a material adverse effect on operating results and financial condition. For example, our historical catastrophe experience includes losses relating to Hurricane Katrina in 2005 totaling $3.6 billion, the Northridge earthquake of 1994 totaling $2.1 billion and Hurricane Andrew in 1992 totaling $2.3 billion. We are also exposed to assessments from the California Earthquake Authority and various state-created catastrophe insurance facilities, and to losses that could surpass the capitalization of these facilities. Our liquidity could be constrained by a catastrophe, or multiple catastrophes, which result in extraordinary losses or a downgrade of our debt or financial strength ratings. In addition, we are subject to claims arising from weather events such as winter storms, rain, hail and high winds. The incidence and severity of weather conditions are largely unpredictable. There is generally an increase in the frequency and severity of auto and property claims when severe weather conditions occur. Green text coloring added by RISKVIEWS to highlight mention of risk management activities. Catastrophe losses could materially and adversely affect our results of operations, our financial position and/or liquidity, and could adversely impact our ratings, our ability to raise capital and the availability and cost of reinsurance. Our property and casualty insurance operations expose us to claims arising out of catastrophes. Catastrophes can be caused by various natural events, including, among others, hurricanes and other windstorms, earthquakes, hail, wildfires, severe winter weather, floods and volcanic eruptions. Catastrophes can also be man-made, such as a terrorist attack (including those involving nuclear, biological, chemical or radiological events), explosions, infrastructure failures or a consequence of political instability. The geographic distribution of our business subjects us to catastrophe exposures in the United States, which include, but are not limited to: hurricanes from Maine through Texas; tornadoes throughout the Central and Southeast United States; earthquakes in California, the New Madrid region and the Pacific Northwest region of the United States; wildfires, particularly in the Southwest; and terrorism in major cities in the United States. In addition, our international operations subject us to catastrophe exposures in the United Kingdom, Canada and the Republic of Ireland, as well as to a variety of world-wide catastrophe exposures through our Lloyd’s operations. The incidence and severity of catastrophes are inherently unpredictable, and it is possible that both the frequency and severity of natural and man-made catastrophic events could increase. Some scientists believe that in recent years changing climate conditions have added to the unpredictability and frequency of natural disasters (including, but not limited to, hurricanes, tornadoes, other storms and fires) in certain parts of the world and created additional uncertainty as to future trends and exposures. For example, in recent years hurricane activity has impacted areas further inland than previously experienced, thus expanding our overall hurricane exposure. The catastrophe modeling tools that we use, or that we rely on from outside parties, to help manage certain of our catastrophe exposures are based on assumptions and judgments that are subject to error and mis-estimation and may produce estimates that are materially different than actual results. In addition, our increased presence in certain geographic areas, such as in the Midwest and Western regions of the United States, and any changes in climate conditions could cause our data to be more limited and our catastrophe models to be even less predictive, thus limiting our ability to effectively evaluate and manage such exposures. See ‘‘Item 7— Management’s Discussion and Analysis of Financial Condition and Results of Operations—Catastrophe Modeling’’ and ‘‘—Changing Climate Conditions.’’ The extent of losses from a catastrophe is a function of both the total amount of insured exposure in the area affected by the event and the severity of the event. Increases in the value and geographic concentration of insured property and the effects of inflation could increase the severity of claims from catastrophic events in the future. In addition, states have from time to time passed legislation, and regulators have taken action, that has the effect of limiting the ability of insurers to manage catastrophe risk, such as legislation prohibiting insurers from reducing exposures or withdrawing from catastrophe-prone areas or mandating that insurers participate in residual markets. Participation in residual market mechanisms has resulted in, and may continue to result in, significant losses or assessments to insurers, including us, and, in certain states, those losses or assessments may not be commensurate with our direct catastrophe exposure in those states. If our competitors leave those states having residual market mechanisms, remaining insurers, including us, may be subject to significant increases in losses or assessments following a catastrophe. In addition, following catastrophes, there are sometimes legislative initiatives and court decisions which seek to expand insurance coverage for catastrophe claims beyond the original intent of the policies. Also, our ability to increase pricing to the extent necessary to offset rising costs of catastrophes, particularly in the Personal Insurance segment, requires approval of regulatory authorities of certain states. Our ability or our willingness to manage our catastrophe exposure by raising prices, modifying underwriting terms or reducing exposure to certain geographies may be limited due to considerations of public policy, the evolving political environment, changes in the general economic climate and/or social responsibilities. We also may choose to write business in catastrophe-prone areas that we might not otherwise write for strategic purposes, such as improving our access to other underwriting activities. There are also risks that impact the estimation of ultimate costs for catastrophes. For example, the estimation of reserves related to hurricanes can be affected by the inability to access portions of the impacted areas, the complexity of factors contributing to the losses, the legal and regulatory uncertainties and the nature of the information available to establish the reserves. Complex factors include, but are not limited to: determining whether damage was caused by flooding versus wind; evaluating general liability and pollution exposures; estimating additional living expenses; the impact of demand surge; infrastructure disruption; fraud; the effect of mold damage; business interruption costs; and reinsurance collectability. The timing of a catastrophe’s occurrence, such as at or near the end of a reporting period, can also affect the information available to us in estimating reserves for that reporting period. The estimates related to catastrophes are adjusted as actual claims emerge and additional information becomes available. Exposure to catastrophe losses or actual losses following a catastrophe could adversely affect our financial strength and claims-paying ratings and could impair our ability to raise capital on acceptable terms or at all. Also, as a result of our exposure to catastrophe losses or actual losses following a catastrophe, rating agencies may further increase capital requirements, which may require us to raise capital to maintain our ratings or adversely affect our ratings. A ratings downgrade could hurt our ability to compete effectively or attract new business. In addition, catastrophic events could cause us to exhaust our available reinsurance limits and could adversely impact the cost and availability of reinsurance. Such events can also impact the credit of our reinsurers. For a discussion of our catastrophe reinsurance coverage, see ‘‘Item 1—Business—Reinsurance—Catastrophe Reinsurance.’’ Catastrophic events could also adversely impact the credit of the issuers of securities, such as states or municipalities, in whom we have invested. In addition, coverage in our reinsurance program for terrorism is limited. Although the Terrorism Risk Insurance Program Reauthorization Act of 2007 (the Act) provides benefits in the event of certain acts of terrorism, those benefits are subject to a deductible and other limitations. 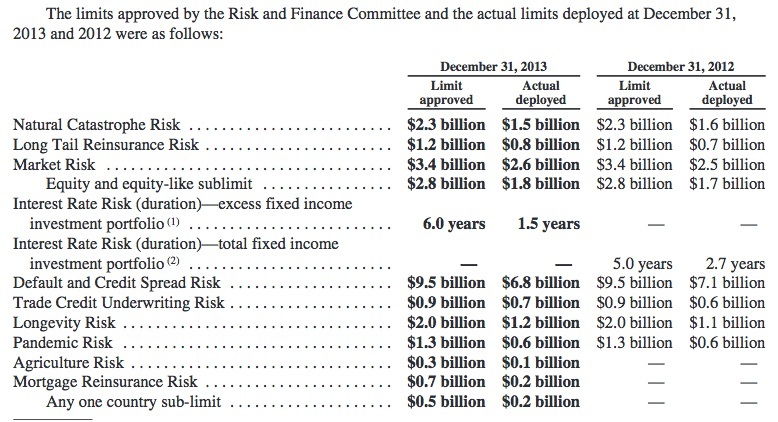 Under this law, once our losses exceed 20% of our commercial property and casualty insurance premium for the preceding calendar year, the federal government will reimburse us for 85% of our losses attributable to certain acts of terrorism which exceed this deductible up to a total industry program cap of $100 billion. Our estimated deductible under the program is $2.08 billion for 2011. In addition, because the interpretation of this law is untested, there is substantial uncertainty as to how it will be applied to specific circumstances. It is also possible that future legislative action could change the Act. Because of the risks set forth above, catastrophes such as those caused by various natural events or man-made events such as a terrorist attack, including ‘‘unconventional’’ acts of terrorism involving nuclear, biological, chemical or radiological events, could materially and adversely affect our results of operations, financial position and/or liquidity. Further, while we seek to manage our exposure to man-made catastrophic events involving conventional means, there can be no assurance that we would have sufficient resources to respond to claims arising out of one or more man-made catastrophic events involving so-called weapons of mass destruction, including nuclear, biological, chemical or radiological means. The Company uses various analyses and methods, including computer modeling techniques, to analyze catastrophic events and the risks associated with them. The Company uses these analyses and methods to make underwriting and reinsurance decisions designed to manage its exposure to catastrophic events. In making underwriting and reinsurance decisions for hurricane and earthquake exposures, the Company uses third-party proprietary computer modeling in an attempt to estimate the likelihood that the loss from a single event occurring in a one-year timeframe will equal or exceed a particular amount. The tables below set forth the estimated probabilities that losses from a single event occurring in a one-year timeframe will equal or exceed the indicated loss amounts (expressed in dollars and as a percentage of the Company’s common equity). 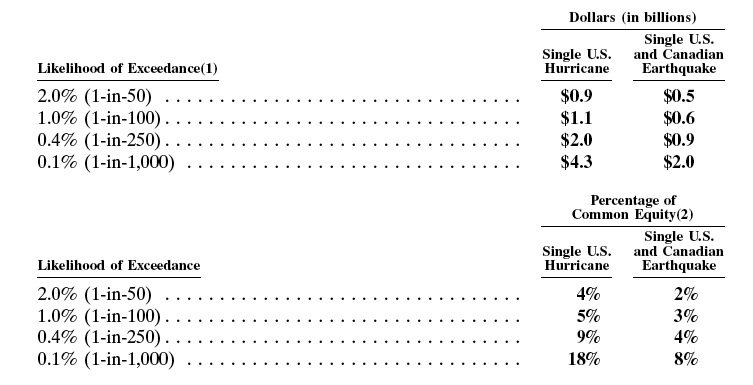 For example, on the basis described below the tables, the Company estimates that there is a one percent chance that the Company’s loss from a single U.S. hurricane occurring in a one-year timeframe would equal or exceed $1.1 billion, or 5% of the Company’s common equity at December 31, 2010. Dollars (in billions) Single U.S. The last disclosure does provide good context for their risk level. And their ability to even disclose this information suggests a likelihood that they may be actually using this information to manage the risk. And finally, Travelers does disclose in the list of management that there are two senior executives, out of about 50 listed, with the words “Enterprise Risk Management” as a part of their title. Many people struggle with clearly identifying how to measure the success of their risk management program. But they really are struggling with is either a lack of clear objectives or with unobtainable objectives. Because if there are clear and obtainable objectives, then measuring success means comparing performance to those objectives. The objectives need to be framed in terms of the things that risk management concentrates upon – that is likelihood and severity of future problems. The objectives need to be obtainable with the authority and resources that are given to the risk manager. A risk manager who is expected to produce certainty about losses needs to either have unlimited authority or unlimited budget to produce that certainty. The most difficult part of judging the success of a risk management program is when those programs are driven by assessments of risk that end up being totally insufficient. But again the real answer to this issue is authority and budget. If the assumptions of the model are under the control of the risk manager, that is totally under the risk manager’s control, then the risk manager would be prudent to incorporate significant amounts of margin either into the model or into the processes that use the model for model risk. But then the risk manager is incented to make the model as conservative as their imagination can make it. The result will be no business – it will all look too risky. So a business can only work if the model assumptions are the join responsibility of the risk manager and the business users. The Risk Management program will provide the information and facilitate the process for management to maintain capital at the most efficient level for the risks of the firm. The Risk Management program will provide the information and facilitate the process for management to maintain profit margins for risk (pricing in insurance terms) at a level consistent with corporate goals. The Risk Management program will provide the information and facilitate the process for management to maintain risk exposures to within corporate risk tolerances and appetites. The Risk Management program will provide the information and facilitate the process for management and the board to set and update goals for risk management and return for the organization as well as risk tolerances and appetites at a level and form consistent with corporate goals. The Risk Management program will provide the information and facilitate the process for management to avoid concentrations and achieve diversification that is consistent with corporate goals. The Risk Management program will provide the information and facilitate the process for management to select strategic alternatives that optimize the risk adjusted returns of the firm over the short and long term in a manner that is consistent with corporate goals. The Risk Management program will provide information to the board and for public distribution about the risk management program and about whether company performance is consistent with the firm goals for risk management. Note that the firm’s goals for risk management are usually not exactly the same as the risk management program’s goals. The responsibility for achieving the risk management goals is shared by the management team and the risk management function. X1 The Risk Management program will assure that the firm maintains profit margins for risk at a level consistent with corporate goals. X2 The Risk Management program will assure that the firm maintains risk exposures to within corporate risk tolerances and appetites so that losses will not occur that are in excess of corporate goals. X3 The Risk Management program will assure that the firm avoids concentrations and achieve diversification that is consistent with corporate goals. X4 The Risk Management program will assure that the firm selects strategic alternatives that optimize the risk adjusted returns of the firm over the short and long term in a manner that is consistent with corporate goals. The worst case situation for a risk manager is to have the position in a firm where there are no clear risk management goals for the organization (item 4 above) and where they are judged on one of the X goals but which one that they will be judged upon is not determined in advance. Unfortunately, this is exactly the situation that many, many risk managers find themselves in. Discussions with senior executives have suggested that decision signals from ERM would be more credible and that ERM would be a more effective management process if ERM were shown to reconcile the risk concerns of policyholders and shareholders. Creditors, including policyholders, and rating agencies or regulators whose mission it is to protect creditors, and shareholders are all interested in the financial health of an insurer, but in different ways. Creditors want to be assured that an insurance company will be able to honor its obligations fully and in a timely manner. For creditors, the main risk question is: what is the risk of the business? This is another way to ask whether the company will remain solvent. Shareholders, however, are interested in the value of the business as a going concern, in how much this value might increase and by how much it might decline. For shareholders, the main risk question is: what is the risk to the business? Shareholders are interested in what ERM can do to increase and protect the value of their investment in a company. While both creditors and shareholders are interested in the tail of the distribution of financial results, as an indicator of solvency risk, shareholders are also very interested in the mean of these financial results and their volatility, which could have an adverse impact on the value of their investment. Policyholders and shareholders’ views are different but not incompatible: a company could not stay in business if it were not able to persuade regulators that it will remain solvent and should be allowed to keep its license, or obtain from rating agencies a rating suitable for the business it writes. Its value to investors would be significantly impaired..
Insurers recognize that the main drivers of their risk profile are financial risks, including insurance risk accumulations and concentrations, and the related market risk associated with their investment activities. They understand that resulting risks are best controlled at the point of origination through appropriate controls on underwriting and pricing and through reinsurance and asset allocation strategies that limit the volatility of financial outcomes. Stochastic modeling is being used more broadly by companies to understand how such risks accumulate, interact and develop over time and to evaluate strategies that enhance the stability of outcomes. Capital adequacy is the ultimate defense against severe risk “surprises” from insurance and investment activities. It is of interest to policyholders who want to be certain to collect on their claims, but also to shareholders who want assurance that a company can be viewed as a going concern that will write profitable business in the future. Methodologies used by rating agencies on behalf of creditors describe in detail how the rating process deals with the three main drivers of a company’s financial position and of the volatility (risk) of this position. In response to rating agency concerns, insurance companies focus on determining how much “economic capital” they need to remain solvent, as a first step toward demonstrating the adequacy of their capital. Analyses they perform involve calculation of the losses they can suffer under scenarios that combine the impact of all the risks to which they are exposed. This “total risk” approach and the related focus on extreme loss scenarios (“high severity/low frequency” scenarios) are central to addressing creditors’ concerns. To address the solvency concerns of creditors, rating agencies and regulators and the value risk of shareholders, insurance companies need to know their complete risk profile and to develop separate risk metrics for each group of constituents. Knowledge of this risk profile enables them to identify the distinct risk management strategies that they need to maintain high ratings while also protecting the value of their shareholders’ investment. Leading ERM companies have become well aware of this requirement and no longer focus solely on tail scenarios to develop their risk management strategies.